ters obtainable were placed in the instrument, and the thermometers themselves were carefully tested, their errors determined, and other well-known precautions taken. In this way the temperature at which the intermediate standard No. 9 contains the number of waves given above was determined to within one-hundredth of a degree. The final step in the process is the comparison of the decimeter standard with the standard meter. This is a comparatively simple affair. In fact, it is exactly the same as the comparison of the first intermediate standard with the second, except that the second standard is now ten times as long —which necessitates going through the process ten times instead of twice. 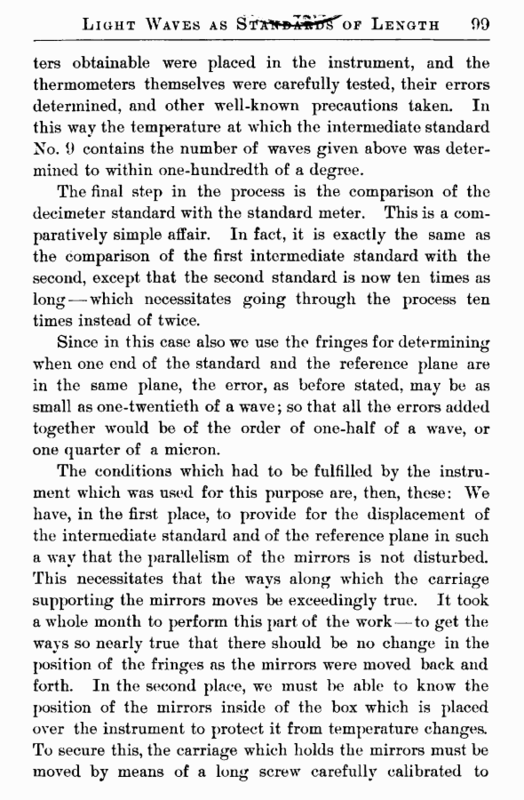 Since in this case also we use the fringes for determining when one end of the standard and the reference plane are in the same plane, the error, as before stated, may be as small as one-twentieth of a wave; so that all the errors added together would be of the order of one-half of a wave, or one quarter of a micron. and a movable support, which moves parallel with itself, for the shorter standard. 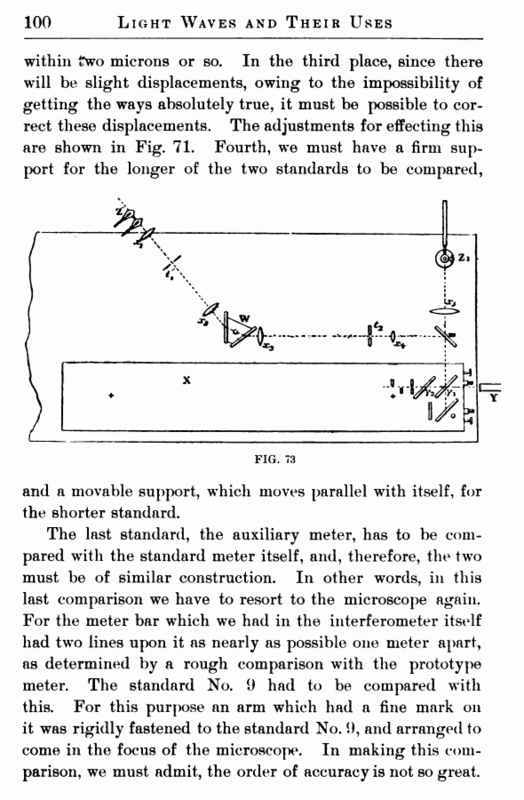 The last standard, the auxiliary meter, has to be compared with the standard meter itself, and, therefore, the two must be of similar construction. In other words, in this last comparison we have to resort to the microscope again. For the meter bar which we had in the interferometer itself had two lines upon it as nearly as possible one meter apart, as determined by a rough comparison with the prototype meter. The standard No. 9 had to be compared with this. For this purpose an arm which had a fine mark on it was rigidly fastened to the standard No. 9, and arranged to come in the focus of the microscope. In making this comparison, we must admit, the order of accuracy is not so great.